Have you ever noticed how anesthesia monitors keep getting stacked on top of each other? Look at this generic Google image of an operating room. The monitors are stacked so high that one needs to be standing up to make any adjustments. This is most annoying when you are sitting at the machine, reading your Kindle, when the surgeons' cautery causes the monitor to alarm. Unless you have arms like Clyde in Every Which Way But Loose, you are forced to stand up to push the "Silence" button on the machine. Very inconvenient. During one of my more inspired, and slacker, moments, I thought, "Why not use a pointer to extend my reach so that I don't have to exercise my quads more than necessary to shut up that stupid alarm?" That's when I came up with the Z-Stick. As you can see from the picture, the Z Stick allows me to reach up to the monitor while staying in my sitting position and push the "Silence" button on the touch screen we use in our hospital. The beauty of the Z-Stick is that it is readily available; it is the endotracheal tube stylet found in every anesthesia cart. It is also extremely cheap and very portable. If you still use the old monitors with physical push buttons you're out of luck as the Z-Stick will probably not allow you to generate enough force to push a physical button, but for the touch screen it is perfect. (It doesn't work with the iPhone or iPad as those require you to touch the screen with your skin. Damn you Steve Jobs.) 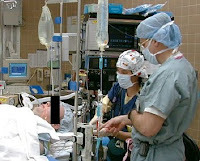 You'll get sneers and eye rolls from your surgical colleagues as this only confirms their worst suspicions about anesthesiologists, but who cares. If I wanted to stand all day and develop spinal stenosis by my 45th birthday I would have gone into surgery. I'm an anesthesiologist. My anesthesia throne is sacrosanct. Nothing will come between me and that comfortable cushy chair, even an irritating, twitchy OR monitor. Try it. You'll never go back to standing again.